Today is the Memorial Day Holiday in the United States. Originally started to honor fallen soldiers of the Civil War, it is now a day to remember all those who have served in the military and gave their lives fighting against tyranny and to keep our freedoms. A couple of years ago I wrote an article about war memorials. There are many war memorials in the United States. 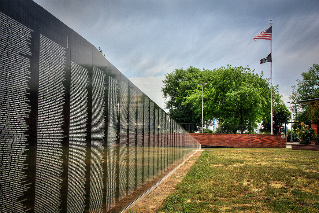 A few, such as the Vietnam Wall, are in Washington D.C. On the National Mall you can find the World War II Memorial and the Korean War Veterans Memorial. In New Mexico where I live there is a Memorial Park in Albuquerque and also a very impressive Vietnam Vets Memorial and Chapel in Angel Fire. Memorials are created to help us remember. They are visible testimonials. When we reflect on the lives of people killed in war it is important to recognize the importance of service. Perhaps someday wars will end and we will have lasting peace. So many men and women have given their lives in pursuit of this, to fight to keep us free. The average life expectancy these days is around 80 years. Not so for many soldiers who died in the prime of their lives. Warriors have to be prepared to die at any time. A quote from Brennan Manning that I posted in 2010 popped up on my Facebook account today. You know how you get reminded of things you previously posted? Well this particular quote is a powerful one, and it reminded me that through many troubled travels we often find grace and light that make life deeper and more meaningful that we'd previously known. The quote was: "To live by grace means to acknowledge my whole life story, the light side and the dark. In admitting my shadow side I learn who I am and what God's grace means." Brennan Manning certainly knew what he was talking about. 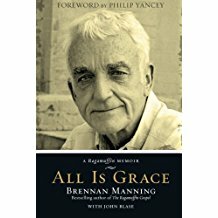 Many people have found great spiritual solace and insight from the "Ragamuffin Gospel" message he shared with so many. Despite his difficult battles with his alcoholism he kept a kind and compassionate heart, especially for the poor and lonely. I read his memoir, All Is Grace, a few years ago, and it really moved me. What Manning reminds us is that we are going to have hard times, just as we will have good times in life. And all of it is important. If we can embrace the journey and be grateful and grow from it, even better, share it with others, we then help other people on their life journey. Americans love celebrities and it seems we ratch it up another notch when it comes to the British Royal Family. Americans are fascinated with them, especially the younger ones as they get married and have babies. The royal wedding for Meghan and Harry is Saturday, May 19, and some people will be up at three or four in the morning to watch the event live on TV, or the "telly" as the Brits call it. So what's the big deal? I am not enamored with it all, but I admit to sort of following the news. So I decided to search on the Internet about this fascination and Google included a link to a post on StudyBreaks, 8 Reasons Why Americans Are Obsessed With The British Royal Family. Some of the reasons make sense to me, such as the royals are a bit like a real-life fairytale, the human element, how we've watched them grow up over the years, and all the history between America and England. Of course, the fact that Meghan Markle, the bride-to-be, happens to be an American contributes to the fascination. Are you planning on watching the wedding? If so, will you be writing about it, perhaps in your journal or diary? Maybe it will be part of a memoir and give future generations insight into what you thought was such big celebrity news. I've been following Humans of New Mexico on my Facebook feed. I live in "The Land of Enchantment" and the stories of people here are interesting to me. The group has a purpose of collecting and sharing the oral histories of everyday New Mexicans. Since I like the phrase everybody has a story this is something I can certainly appreciate and promote. New Mexicans are a diverse bunch. New Mexico did not achieve statehood until 1912, but it was a U.S. Territory for a long time. Previous to that it was part of New Spain. Residents of the state come from that rich heritage, along with Native Americans (quite a few different and fascinating pueblos), immigrants, and an assortment of transplants from other states (like me). There is also an interesting part of the Old West that makes up our state's legacy. Think ranchhands, cattle rustlers, dancehall divas and gunslingers. Tradition has it Billy the Kid died in New Mexico, but not before making his mark. I think Humans of New York was the first "Humans of" group. It is a pretty fascinating photoblog and collection of stories gathered from many interviews. The idea of capturing life stories from everyday people through oral history and photographs is one excellent way to preserve people's personal history. I like to craft longer narratives, but the shorter oral format works well, especially in this day and age when not a lot of people pick up a book (sad to say). If you haven't already checked out some of the stories found on HONY or HONM and other similar sites, please do. These are powerful platforms to learn about our fellow humans.